This entry was posted in Year Zero Survival Blog and tagged bugout bag item, doomsday preppers, fema123, Preppers, preppertalk, prepping, SHTF, shtf prepper, survival, survival blog, survival tips, TEOWAWKI by staff-writer. Bookmark the permalink. Great article, great stuff. Keep it up, it’s really helpful. Thanks. Clever and wonderful idea that makes it interesting to read. Thanks for these post. My grandmother use to DT our mouths shut when we were in trouble for being loud or she just didn’t want to hear one of us crying. It worked. Just another win for DT. Oh and one time while camping with my evil father i was excited and kept asking questions and talking so he DT’d me by my hands, feet, and mouth and taped me in a hammock for the night where i cried myself to sleep. Really taught me a lot about how NOT to be a parent. And I have to say that it was the only time i wished that DT didn’t work so damn good!!!! I all the time emailed this webpage post page to all my associates, because if like to read it then my friends will too. Wonderful goods from you, man. You make it entertaining. I can not wait to read more from you. A great website. If you can manage the hat from duct tape, or a simply wallet (popular craft),, you can also make bags and utility belts. It’s just a matter of design and patience. Wow, superb weblog structure! The total look of your web site is excellent, neatly as the content material! 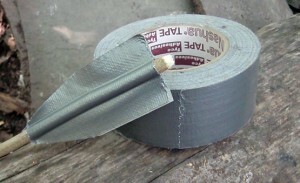 Duct tape is great stuff. Keep up the good work. I really like it. I will surely visit regularly.